Three tower cranes are set to start going up this month on the site of Manchester’s tallest building. The Owen Street project will be home to a cluster of four towers – the tallest topping out at 200 metres. It will be the highest building in the city and the tallest tower outside of London. Renaker Build is overseeing construction of 1,400 flats on the site between Owen Street and Deansgate. 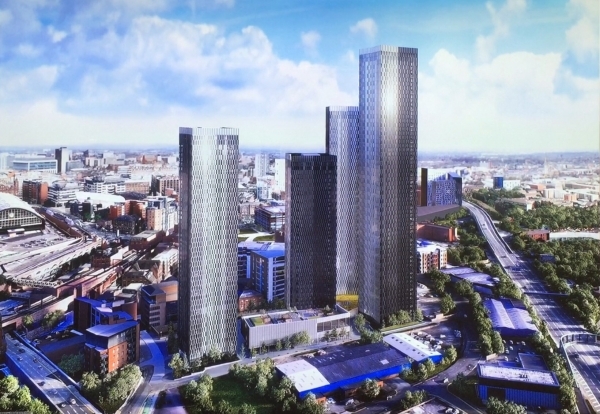 The four towers will range from 37 storeys to 64 storeys high, overshadowing Manchester’s present tallest building the Beetham Tower at 47 storeys. Work on the foundations is currently underway on the site and the Enquirer understands erection of the tower cranes will start within the next couple of weeks. SFL Mobile Radio will be supplying communications for the cranes which will utilise its hands-free radio system. The hands-free system allows drivers to fully concentrate on crane operations whilst maintaining contact with their lifting team.